Free Boardmaker Boards and Activites List Updated! Check it out! Cleaned up and added to for 2011! Visuals Engine from Connectability in Canada joins a number of excellent free visual support and communication board making programs. 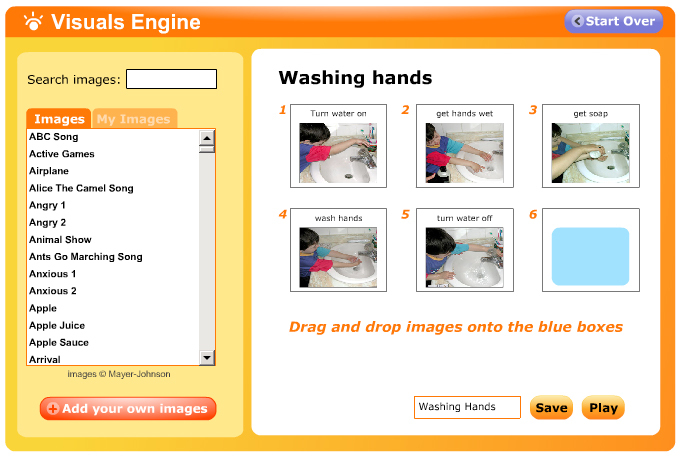 Visuals Engine offers a step-by-step online app to make schedule or communication boards with up to 16 squares. It includes photographs and a limited selection of Mayer-Johnson Picture Communication Symbols. The rest of the site is also worth looking through, with games, information on safety, a resume builder for people with disabilities and more. 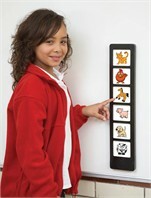 You can see this presentation on the Tobii website. The above presentation is designed for Pre-practice Music Therapists. 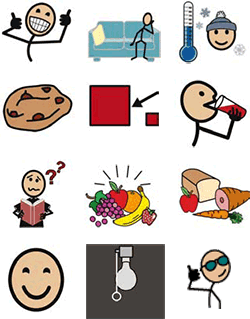 Over time the default picture symbol set used for curriculum support and communication in special education is becoming SymbolStix. Originally designed for use in News-2-You, the current event based curriculum for special needs, SymbolStix are now available in many products. Some special education programs are moving to SymbolStix instead of other picture symbols in order to offer a consistent symbol set across many materials and programs. Ever thought about making homemade conversation hearts? The recipe can be found at Make Monthly and a great photo version of the recipe is at About.com. On day one prepare the dough using your switches with the mixer and our cooking communication pages. This is a fun activity that reinforced requesting a turn, fine motor skills, following directions and switch use. Then let every student have a ball of dough on some parchment paper to knead. Once the dough is formed each student smells the bottles of extract (try lemon, orange, root beer, strawberry and mint) and chooses one to use. Each student is responsible for making one flavor of dough, coloring it with food dye, rolling it out and cutting out the hearts with a cookie cutter. What a wonderful multi-sensory experience with feeling the sugar and dough, see the colors, hearing the mixer and smelling the extracts! Once the hearts are done set them out to dry. The next morning give students were given a selection of 12 picture symbols showing messages that could be written by their adult partner on the candies (love, friends, sweetheart, you're icky, text me...). Students also have a choice of five colored food dye markers to write their messages. This portion of making conversation hearts is all about choice making! Mother Goose website has two jumping games played just with a switch set to space bar, "The Cow Jumps Over the Moon" and "Jack Be Nimble". There are also a number of games great for a touch screen and others that work with multiple switches set to the arrow keys (perfect for those learning to use switches for powered mobility). I was reminded by my blogging friend Rose-Marie at Adapting Creatively that this is Feeding Tube Awareness Week. You can check out her post here. 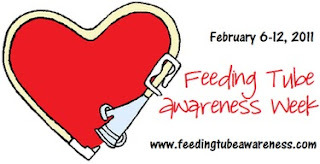 Also see the Feeding Tube Awareness Website. Some resources to think about include the free book for children from Mito Action (please donate to Mito Action a couple of dollars, they do great work for kids with Mitochondrial Disease). I have previously posted about g-tube feedings at school here. Logan's G-Tube Clothes - including special patches to make "Tummy Tunnels"
Includes a talking block (to use as a dice), switches and dry erase boards (Mayer-Johnson does carry a couple of these items.